Or, looking at those who say they were “raised atheist” and their answer to whether they believe in God or a universal spirit, 55% say yes, 26% say no, 6% express another opinion, and 13% say that they don’t know. If you can spin a narrative from that, great. Most commonly suggested is that atheist parents are rather good at making Protestant children in America. Yet all the normal caveats to interpreting statistics apply. I am reluctant to bring them up because I am an atheist myself. I prefer to accept valid empirical data. However, previous (apparently gleeful) reports don’t mention any caveats to interpretation at all, so I guess someone has to do it. Who really knows? 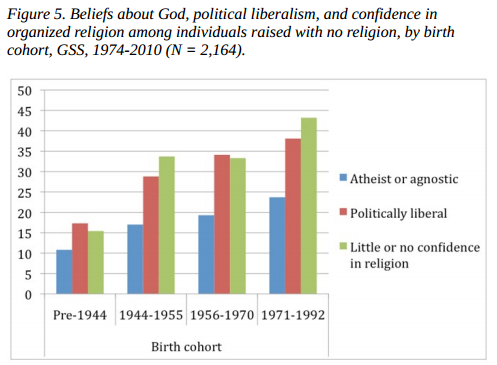 Claiming to be raised atheist (as opposed to being raised in no particular religion, which accounted for 2,020 responses in the survey, over 12 times as many responses as being raised atheist) is a little unusual in the United States in the first place. Perhaps this group in particular needs to be studied more closely. Indeed someone has looked at this and related phenomena more closely: Stephen M. Merino in his article Irreligious Socialization? 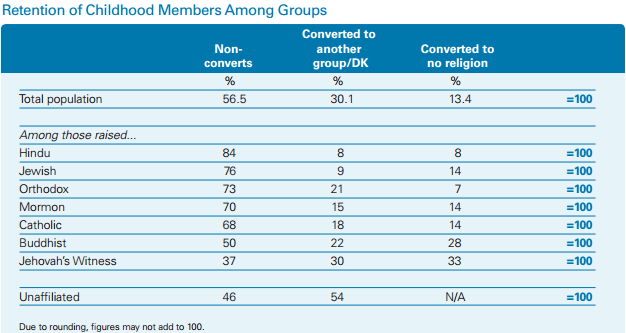 The Adult Religious Preferences of Individuals Raised with No Religion. His article is significant for attempting to break down the phenomenon by age cohort. His study looks at the entire group of people raised with no religion (including as atheist, agnostic, or “none”). He explains this, in part, by the fact that it is increasingly common for someone with no religious affiliation to find a partner in adulthood who also has no religious affiliation. However, as they say in finance, “past performance is not a guarantee of future results.” If we want to know what young people today will grow up to believe, only time will tell. PS – You can download some of the relevant Pew Forum data in an Excel spreadsheet here and the original data here. PPS – Other, more recent surveys from 2012 put the “retention rate” for the unafilliated at 53% or 61%.